With a little knowledge and preparation, you can have a healthier and safer household this winter. The place to start the search for health risks is looking at changes you may have made to your home. How moisture and air move through your home can be effected by changes in furnace systems, windows, doors or insulation. Building additions and interior french drains can also change the nature of the indoor environment. If you had any of those changes to your home, you need to have a second look at the indoor environment. 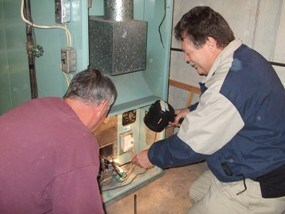 Furnaces need checked by a qualified, expert furnace service professional each heating season. There is a reason for all the descriptive qualifiers in front of the word service professional. Many service companies will only check if the furnace turns on. They often do not check each of the critical issues relating particularly fossil fueled furnaces. Heat exchangers will eventually fail, gas leaks occur as the pipe sealant dries, condensate lines can leak and damage a furnace. Many times, the vent system has deteriorated or more amazingly, never been installed properly in the first place. Over the years, I have found countless furnaces that have had undiagnosed defective heat exchangers. I have walked into a furnace room and without even pulling out a single tool, observed gas leaks, sewer odor from defective condensate lines, and blocked or damaged vent systems.